In addition to annual donations, there are many ways to give back to Alpha Chi Sigma. Alpha Chi Sigma can only thrive with members who participate and give in any and all ways to the Fraternity and all of their fellow Brothers. Each donation, regardless of the size, helps enhance the journey for future generations. Your contribution will designate you as an active professional Brother and you will receive all four issues of The HEXAGON. Make your donation today! Alpha Chi Sigma now offers the option of donating on a monthly basis. There is a $10/minimum, and the donation will be deducted on the first business day each month. To enroll, Donate Now! Contact the National Office with any questions. Planned giving, sometimes referred to as gift planning, is a method of supporting non-profits and charities through estate planning. While gifts can be cash or securities, more typically planned gifts are in the form of will bequests, charitable trusts, and gift annuities. The intended purpose of the gift can be to endow a scholarship, to support a specific program, chapter or group. For more information, the National Office would love to talk to you about any future planning. Alpha Chi Sigma has teamed up with various organizations that both provide a benefit to members and give back to the Fraternity. GEICO is saving Alpha Chi Sigma Brothers 15 percent or more on their car insurance. And even better - every time a member goes to visit this site to get a quote, GEICO donates money to Alpha Chi Sigma! PointWorthy's mission is to unlock billions of dollars of value in loyalty points for charitable donations. The website allows you to connect directly to Alpha Chi Sigma, as well as many other non-profits, to donate your credit card loyalty points. Simply go to the Alpha Chi Sigma Fraternity Natl Office PointWorthy page. Once you link your account to PointWorthy, you can donate your points directly to the Fraternity (for example, 2,500 ThankYou® Points from Citi is $25.00 to Alpha Chi Sigma). Donations you make to Alpha Chi Sigma are tax deductible and documentation of your giving history is available through PointWorthy. There are so many ways you can give your time back to the Fraternity. 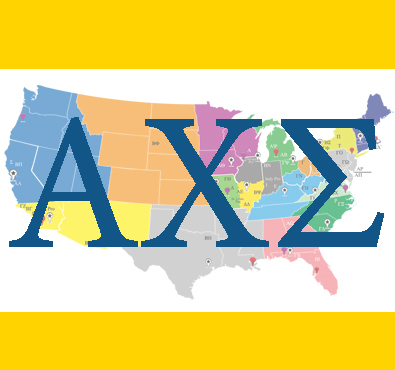 By serving in one of many leadership roles, such as a District Counselor, Professional Representative, a district committee member, or even as a member of the Supreme Council, you can help make Alpha Chi Sigma a successful organization. If you're interested in giving presentations related to alchemy, the history of chemistry or various scientific and professional topics, send an e-mail to speakers@alphachisigma.org to join the Speaker's List! Your information will be shared with chapters that are looking for speakers at chapter-sponsored seminars, District Conclaves, and other events. Or simply get more involved in a chapter near you! If there isn't a professional chapter or group in your area, contact our Professional Expansion Committee Chair - who can provide support in connecting you with other members in the area. The best way to start involvement is to simply attend a professional event held in your area, attend a Conclave or support a local chapter by sponsoring a science outreach program or other event.